MIDDLE BRONZE AGE, 1900-1650 B.C. 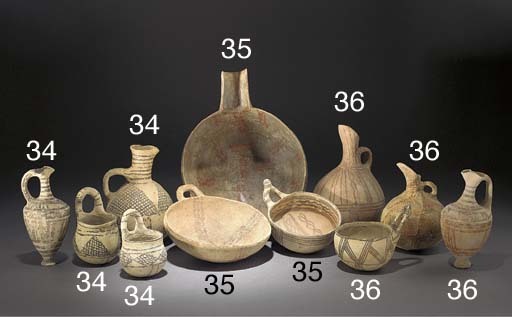 The Art of Ancient Cyprus, p. 31, pl. 24b (item one), p. 55, pl. 62c (item two), p. 53, pl. 54 (item three), p. 52, pl. 51 (items four to six), p. 59, pl. 74b (item seven), p. 58, pl. 71b (item eight), p. 63, pl. 84a (item nine), p. 66, pl. 100b (item ten), p. 76, pl. 145 (items eleven and twelve) and p. 71, pl. 121b (item thirteen).